Jean_Duc_de_Berry is a Legacy Library. Legacy libraries are the personal libraries of famous readers, entered by LibraryThing members from the Legacy Libraries group. » Jean, Duc de Berry's catalog. » Jean, Duc de Berry's legacy profile. Jean_Duc_de_Berry is also an author. About meBorn Nov. 30, 1340 in Chateau de Vincennes, France, third son of King Jean le Bon (John II the Good) of France. 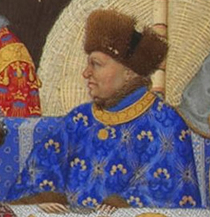 Brother of Charles V, King of France, and Louis I of Anjou, King of Naples, and of Philip the Bold, Duke of Burgundy. Also known as John of Valois, the Magnificent, first Duke of Berry, Duke of Auvergne, Count of Poitiers and Montpensier. His first wife was Joanna of Armagnac, by whom he had 3 sons and 2 daughters. His second wife was Jeanne d'Auvergne. Largely due to his urging, King Charles VI of France, and his sons, were not present at the Battle of Agincourt in 1415. He died the following year, in March 15, 1416 in Paris, France. About my libraryI am famous as a patron of the arts, particularly those of manuscripts. Most reference books that discuss books of hours in general, or specifically, provide information about those in the Duke's collection. Note that books published in the 1970s and before often do not list the manuscript's current location's accession number. There are also a remarkable number of sites found via Google that summarize this information in English.